SKU: CS99149. Categories: Bodybuilding, Health & Fitness. Tags: bodybuilding, exercise, exercise technique, natural, physique, Stuart McRobert, weight lifting, weight loss, weight training. 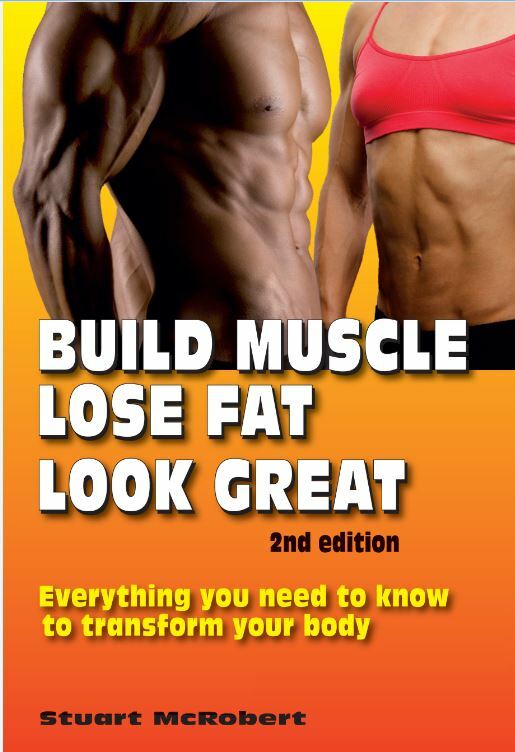 While the first edition of Build Muscle, Lose Fat, Look Great may have been the most complete book on how to transform your body, the second edition is even better. The most important change is the brand new Chapter 17: How to design your own training programs. This chapter reflects Stuart’s six years of additional experience and research. In addition, Chapter 19 has been revised, as have some of the most important sections of exercise technique in Chapter 12. And many other improvements have been made throughout the book. There are 24 chapters and 640 pages crammed with practical, safe and highly effective instruction on just about everything to do with building a terrific physique, including 200 pages (and hundreds of photos) devoted to exercise technique. And it includes comprehensive material for beginners, so that they can get started correctly. But the book is not just for beginners. Its guidance is for intermediate and advanced bodybuilders, too. Build Muscle, Lose Fat, Look Great is a definitive guide for men and women of all ages. Learn how to become your own expert personal trainer. A brilliant book! Follow the program developed by Stuart and you will reach your potential for strength, muscle mass, fitness, and health. — Richard Winett, Ph.D., Professor at Virginia Tech, publisher of Master Trainer, and award-winning health researcher. Utterly complete, a book for men and women who want to be in shape, or to compete at the highest level. All the required information is here. — Kathy Leistner, BA, MA, MS, exercise physiologist, past competitor at national and world powerlifting championships, and a former Ms. California. I hope you read this big, inspiring book. Once you are done, put it on your bookshelf in a place of ready access. This is a book — a treasure, really you will want to pull down and read more than once. From a review of the first edition, published in a UK issue of FLEX magazine, by Stephen Wedan. Stuart McRobert is one of the most respected writers in the exercise genre. He was first published in 1981, and has written for all the main bodybuilding magazines, including Muscle & Fitness, FLEX, and Iron Man well over 500 articles in total. He has a degree in education, over 40 years of training experience, over 30 years of coaching experience, was the editor of a bodybuilding magazine for 15 years, and is the author of these four other books on physique transformation: Brawn, Beyond Brawn, The Insider’s Tell-All Handbook on Weight-Training Technique, and the first book of his New Brawn Series: How to Build up to 50 Pounds of Muscle the Natural Way.